Urban living with comfortable style and substance blended with tranquility, privacy and security is on track to becoming a reality at The Grand Towers, an edifice that would be the symbol of Moldex's continuous effort in providing investments that allows you to live your well-deserved life. 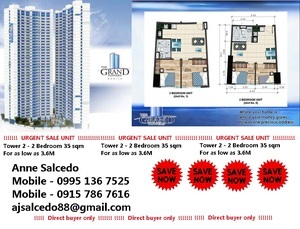 The Grand Towers was borne out of the vision to create a condominium project that exudes excellence, incomparable elegance and style. Its developer aimed to come up with a product that will meet the needs and demands of the sophisticated living and discriminatinag taste of the upper class. With the project's Tower One scheduled turn-over on 2010, the dream of sharing this product of excellence will soon be fulfilled. Located in Vito Cruz, Manila, The Grand Towers is centrally placed - a few minutes from the Makati Central Business District and an easy drive from domestic and international airports via Roxas Boulevard.